Yes, folks, for the first time since December 2001, I am building a gingerbread house. Or, technically speaking, a gingerbread barn. =) Since everyone seemed to enjoy the pictures I took of the last one I made, I'm doing it again. But this time, with even more photos, documenting every last bit of its construction! 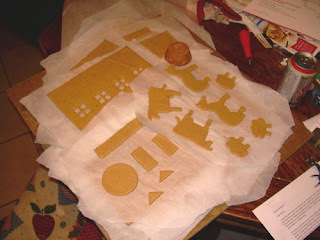 So far, all of my creations have come out of a book called Gingerbread: Things to Make and Bake. This year's entry is no exception. It has patterns for all of the pieces needed for each creation, in the actual size. 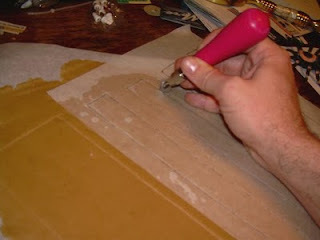 So the first step is much like carving a stamp--tracing! 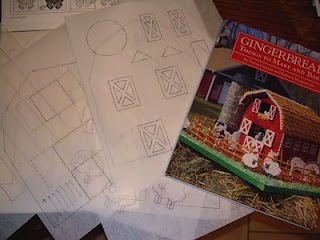 I pulled out a pad of tracing paper and copied each of the patterns for the barn that graces the cover of the book. If a particular piece is needed more than once, I trace it multiple times. I tend to ruin the tracing paper after cutting out each piece, so I don't reuse them. So in this first photo, you can see the book along with the pages I've traced out of it. Gotta include ginger if it's going to be a real gingerbread house, of course! 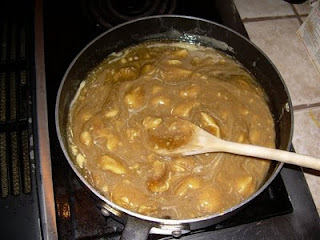 Now for the 'wet' ingredients: corn syrup, brown sugar, and margarine. The lumps in the saucepan is the unmelted margarine. And finally, mix it all together, and presto! Gingerbread! Doesn't look like much, does it? 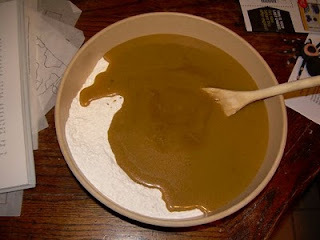 After several minutes of mixing, first with a spoon then with my hands after the gingerbread started getting too hard to mix with a spoon, and it starts looking more like gingerbread. I let it cool a bit before starting the masterpiece! 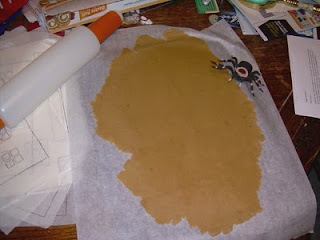 I roll out the gingerbread on parchment paper, then place my tracing over it. Is that a Speedball linoleum cutter in my hand? YES! It is! =) I tell you, it's just like carving stamps. Except this time, I'm cutting directly through the lines and completely through the gingerbread. 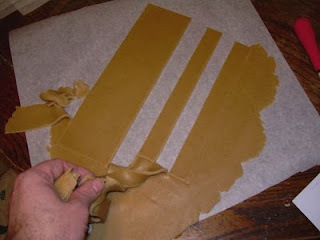 Once the cutting is done, I remove the tracing paper and peel off the parts of the gingerbread that aren't part of the structure. 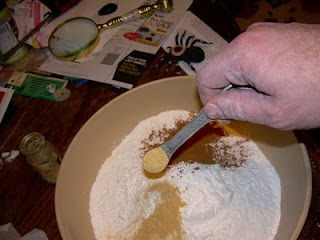 I put the extra gingerbread back in the bowl to be rolled out again and again, until all of the pieces are done. 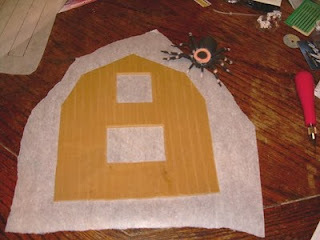 This here piece is the front of the barn, waiting its turn in the oven. (I had quite the assembly line going.) This particular piece I scored to give the appearance of wooden planks. I did this to all of the walls for the barn. This side wall for the barn just got out of the oven and is cooling on a wire rack. You can't see the "wooden planks" as well in the photos after it bakes, but I did the same thing with this piece as the front of the barn. Finished! At least with baking all of the gingerbread pieces. All of these pieces of cooled and I piled them on top of each other since I ran out of places to store it. Assembly will have to wait for another day--it took me about five hours to trace all the pieces, make the gingerbread, cut out all of the gingerbread pieces, bake them, yadda, yadda, yadda. This is not a one-day project! I just saw your pics of your 2001 Gingerbread house! AMAZING! Makes me want to try to make one! I'm getting hungry....will settle for one of the sheep. My college roommate and I made a gingerbread house and barn for our dorm one year. We cheated though and used cardboard. Now my 7yo wants to make a whole village. Your pieces are way more stunning than ours will be though. Great job, Ryan! Are those COWS I see?!?!?!?! A neighbor and I made real gingerbread houses for the kids until the oldest reached first grade. They made them out of graham crackers at school. We have used that method for the last 11 years. 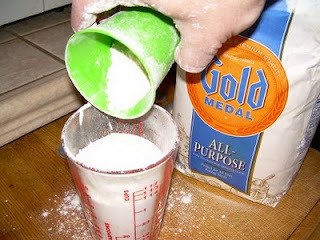 No more wasting of good ingredients, and it is a time saver for us. 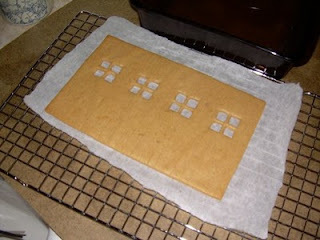 You can't see the "gingerbread" when we are done anyway. We do 6 houses,and only some of the kids eat them. It is very interesting what teen boys make their houses into. This is a little like quilting, Ryan, except when I sew, I'm not tempted to eat the pieces. I applaud your creativity and your attention to detail--qualities that, coincidently, make a great computer programmer! You got your cows, horses and sheep...but where is the turtle???? 5 hours??!! So that's why I've yet to try doing a gingerbread project all these years. I think I'll live vicariously through you for now. Oh, and just a little request.....would you mind making one of those horses a Paint Horse, please?